To say this year has been interesting is an understatement. Most folks would say this year was hard, difficult, challenging or even bad. I say the year was interesting because it has been a place I didn’t know I would have to go. When Carl was diagnosed with Autism in 2003 I read an article trying to describe autism to a person with no idea of what autism is and how it affects you. The article described it this way (I’m paraphrasing). You have planned a trip to France. You have learned French, you have studied the maps of France, you know where you are going to go, how to get there and what sites you are going to see. You pack your bags; you have everything you need for the trip. You board the plane but when you land you are not in France you are in Argentina. Argentina is nice and all but you have no clue of where you are, or where to go, what to see, how to speak the language or even if you are properly equipped to be in Argentina. That is what this year has been like. Most people have said “You are so strong” “You have touched so many lives” “I don’t know how you do it”. Well there is one answer to all those statements: JESUS!!! When you hear the pastor’s say you must become less so he can become more. This is what they speak of. When people say those things to me I am thankful that they see that but each time I pray “Father God please allow them to see who you truly are! Not me! I am nothing without you and I know that I can do nothing without you!” I am not strong but God is! I have not saved one person but God has and if he has chosen to use me then I am the better for it! And I can’t tell God thank you enough for allowing this broken woman to fulfill his purpose! I know lots of people who didn’t make it after the loss of a loved one but I also know lots of people who have made it. The crucial element is JESUS!!! In the past year there have been times where I have broken down. They have come at inconvenient times, messy times, down right wrong times. They have come when I had to be broken down in front of others. BUT it also shows that it is NOT ME but HIM that lives in me that keeps me going. I didn’t know that I had to live my life through the death of a child. There are days I wish I could change it but on those days I know I am being selfish and Alex would not want to come back here after sitting with our Lord! I also wouldn’t say our year has been bad. We have had some bumps but overall we have had some amazing experiences as well. 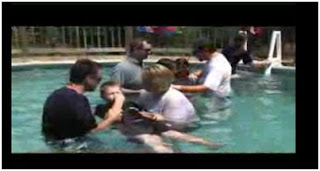 Today September 20, 2009 I was allowed the amazing pleasure of watching my baby chose to follow Christ!!! What an extreme pleasure that Lord allowed me to experience!! I have gotten to see all three of my children choose to follow Christ. I don’t think I could have asked for a better gift. It is one thing to give birth to a child but to give them back to the Lord is a completely different experience. Words can not express the joy, love, peace, amazement, and thrill that you feel watching this moment. So is there Life After? Yes there is life after. Yes there was life before but what an amazing life we get to live when we live it all out for Him!! !